Designed to comply with national security guidelines, the TSU (Transport Security Unit) sack holder is the ideal paper and non-recyclable combined waste solution for transport and leisure locations. We were proud to become part of the #DriveDownLitter movement by providing Hubbub with a selection of eye-catching Combo Delta Litter Bins. Glasdon, a manufacturer of GRP and steel buildings and housings, have extended their range of IP rated enclosures and outdoor equipment cabinets with the launch of five new weatherproof cabinets. Part 2 of the journey to a zero waste restaurant identifies techniques to remove the food waste which occurs through the dining experience. How realistic is a ‘zero waste’ commercial kitchen? What steps are F&B business owners, management, chefs and front of house taking to reduce, recycle and eliminate food waste in their restaurants altogether? Maybe you are closer than you think. Reading railway station first opened in 1840 as the temporary western terminus of the original line of the Great Western Railway. A new Gateway has been helping Hartford Parish Council make a real impression on commuters travelling to and through their local community. Repak offer some top tips to help improve day to day recycling in Ireland, which could present a good opportunity for schools. Flambards Theme Park in Helston, Cornwall has been a popular attraction, promising the best day of the week for all the family, for the last 40 years. Stirling Castle is one of the largest and most important castles both historically and architecturally in Scotland. 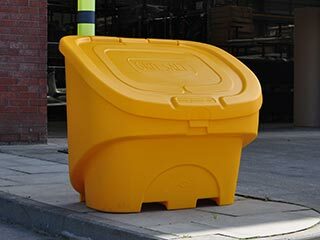 Glasdon are proud to sell our Plaza® litter bins to Ikea in their signature yellow colour. Make a B-Line for Water Safety? Blackpool Pleasure Beach made theirs by placing an order for the Glasdon B-Line™ Throwing / Rescue Buoys. Ishida Co Ltd is a world leader in in the manufacture of weighing and packaging equipment, mainly centred on the food industry. The business was founded in Japan in 1893 and is still owned and operated by the Ishida family. Volvo Powertrain is the world's largest manufacturer of heavy-duty diesel engines, with 8,000 employees in Sweden, France, North and South America. Volvo Powertrain North America is based in Hagerstown in Western Maryland, manufacturing D11, D13 and D16 engines for Volvo and MACK trucks at the 1.5 million square foot facility. Following an expansion of the scheme, Glasdon were delighted to have supplied their Nexus® Shuttle recycling bins to various franchises in the Leicestershire, Cheshire and Lancashire areas to be used for the collection of used coffee grounds. 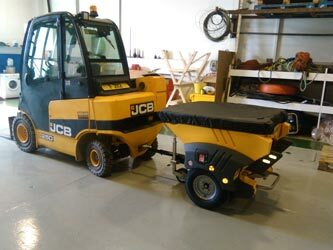 Keep your site or streets safe this winter with the new Turbocast 800 Gritter from Glasdon. The Institute of Chartered Accountants England & Wales (ICAEW) is a professional organisation created by Royal Charter in 1880. With more than 140,000 members (15,000 of them working outside the UK), the ICAEW ensures that Chartered Accountants attain the highest possible standards, through extensive training and professional development. Above us only sky - but around us, Glasdon products are making Liverpool John Lennon Airport safer for travellers and staff. Motorway service operator Welcome Break has been shortlisted for the Retail/Service Sector Recycler of the Year award at the prestigious National Recycling Awards. Moray College opened as Elgin Technical College in 1971 and is now a thriving member institution of the University of the Highlands and Islands, a federation of 13 colleges and research institutions from Perth and Dunoon to Stornoway and the Shetlands. Opened in 2009, the Yorkshire Wildlife Park occupies 70 acres of land just outside Doncaster and is home to hundreds of animals, including lions, wallabies, giraffes and critically endangered creatures like the Siberian tiger and Amur leopard. As part of our commitment to ensuring our customers are satisfied with our products and service levels, as well as our responsibilities as an ISO9001 certified company, Glasdon UK regularly conducts customer satisfaction surveys. The St Aidan's Society has its origins at Durham University in the first group of women permitted to study at the institution. The Society was formally founded in 1947, and expanded to full college status in 1961. Josephine Butler College is the newest college of the University of Durham, one of Britain's top-rated universities. The College opened in October 2006 as the University's first Durham expansion since 1972, and the first purpose-built self-catering facilities on campus. The new Eco Nexus® Duo Recycling Bins from Glasdon UK are a compact indoor recycling solution for multiple waste streams. Two new models of Combo Recycling Bins are now available to increase recycling rates in food service areas. The new Fusion Seat and Bench from Glasdon UK are robust, economical and environmentally friendly. Glasdon outdoor seating compliments the quaint, beautiful village of Letham in Angus, Scotland perfectly. Angus is one of the 32 local government council areas of Scotland, with area borders of Aberdeenshire, Dundee City, Perth and Kinross. Pinewood Studios in Buckinghamshire is the centre of the British film and television industry. Hundreds of blockbusters have been shot at the studio since it opened in 1936, from Carry On and Hammer Horror to modern hits like Harry Potter and The Hobbit. Pinewood has over 1,000,000 square feet of stage space spread across 34 stages. Blackpool & Fylde College is a National Beacon of Excellence further education college with four sites on the Fylde coast. The College's main Bispham campus has recently undergone a £6m upgrade, with extensive new teaching facilities including an Aviation Academy with its own Piper Cherokee, the UK's first Gaming Academy offering a realistic casino environment, and an Automotive Academy with MOT testing centre and rolling road. Retail display units are a common sight on petrol forecourts all over the country. The majority of units are made of painted metal, which quickly gets scratched and dented. Exposed metalwork is easily corroded by leaks and spills of the kind of products usually displayed in such units, like screen wash and rock salt. 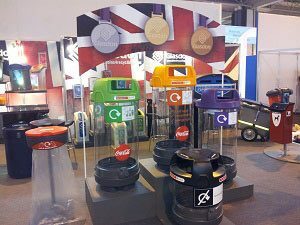 Britain is recycling! Government statistics show the total amount of waste we generate falls every year, and the amount we recycle continues to rise. Road safety improvement works were recently implemented on the A71 in East Ayrshire at the busy Moorfield Roundabout. This primary route provides Ayrshire with a link to the M74 and beyond to Edinburgh. The roundabouts chevron signage and road markings were upgraded as part of an accident prevention scheme following a history of recurring speed related injury accidents. Recycling & Waste Management (RWM) is Europe's largest exhibition and conference for the waste industry, with more than 750 exhibitors and thousands of visitors. Here at Glasdon UK we're all more than a little jealous of the Sherwood Litter Bin. Have you tried our Live Chat? Last summer, Glasdon UK relaunched the bins4recycling.com website - a refreshing new look that has been rolled out across the whole company over the last several months. One feature we're particularly proud of is the integrated live chat facility you may have noticed in the bottom right corner of your screen. The New Aero Shelter from Glasdon is totally corrosion free with an attractive contemporary design. As part of Glasdon's commitment to exceptional customer service, as well as our responsibilities as an ISO9001 certified company, the company regularly undertakes customer satisfaction surveys. The brand new Nexus Shuttle is the ultimate food waste collection bin. The Resource Efficiency & Waste Management Solutions Exhibition in partnership with CIWM has ended for another very successful year. 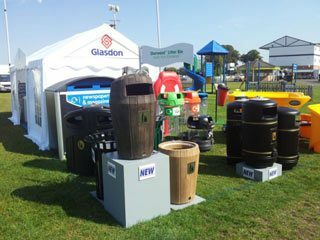 Glasdon UK will once again be exhibiting at the Recycling & Waste Management Exhibition (in partnership with CIWM), which runs 11-13 September 2012 at the NEC, Birmingham.